In a large pan combine all the ingredients for the chicory, bring to the boil, reduce the heat and simmer gently, covered, for 1 hour, or until the tip of a knife slides easily into the chicory. Leave to cool in the liquid. Melt the butter for the celeriac in a large frying pan over a medium heat. When foaming, add the celeriac. Season and cook for 15-20 minutes or until a rich golden brown. Add the wine, port and water, reduce the heat and simmer for 4 minutes. Push through a fine sieve into a small pan, to remove all the liquid from the celeriac. Adjust the seasoning. About 25 minutes before serving, combine all the ingredients for the chestnuts in a small pan. Bring to the boil and cook on a low heat for 20 minutes or until very soft. Reheat the chicory in its liquid. Reheat the celeriac jus. 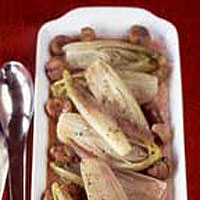 Drain the chicory, put 1 head on a each plate, arrange the chestnuts around, spoon the celeriac jus over, and serve. This recipe was first published in December 2004.